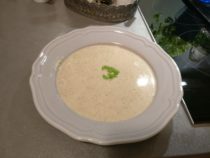 Tonight, we used the soup making device of the Gods, the Thermomix from Vorwerk (German soup engineering at its finest), to whip up a nice homemade cream of mushroom soup. The cool thing about it is that the Thermomix makes wonderful soups (and also delicious nut butters), among other food items of course, and it takes you through the recipe step by step. It even has a built-in scale!